Hello, I’m Julie and I have fine, frizzy, FFS sort of hair. Indeed, Stephen told me air is not my friend. Because you see, my hair + air (and no salon time) spells disaster. Maximum devastation. I can leave the house with hair that appears swingy and sleek, having spent hours of my life putting all manner of luxe-y products through, carefully smoothing further with GHDs and adding even more smoothing things. And then, air happens. 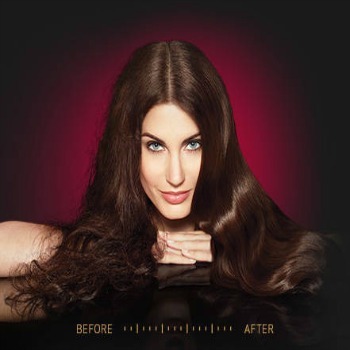 I go from sleek to hair halo in minutes. It’s as though I love a backcomb. Or the bedraggled look. You know, the one where you run repeatedly through foliage. There was only one thing for it: The Nanokeratin System at Lustig & Webb. Loosely translated, that means it’s non-soluble so once it’s on, it’s on. The leaflet says this smoothing goodness works for up to 16 weeks ackch. Which is, erm, 4 months. It’s got vitamins, amino acids, antioxidants and essential oils packed in too, which all add up to one thing: the promise of gorgeous, frizz free hair. 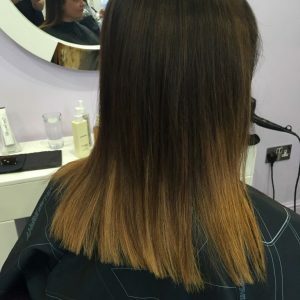 It’s not that Brazilian straightening blow dry thingy either, and it works on coloured and chemically treated hair – so if you have had that done, fear not. 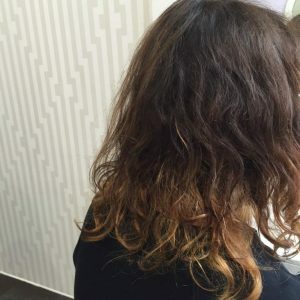 As you can see, Daniel’s balayage graces the ends of my locks. Priming shampoo goes on first, then you get your hair blow dried ’til it’s bone dry. Then, depending on your hair type (natural, coloured or sensitive) the smoothing cream is applied all over, combed and left to do its thing for 40 mins. GHD irons iron the hair flat all over and you’re ready to go. Because you leave the treatment in for 72 hours – take the day off on Friday, get it done first thing in the morning, or last thing Thursday. Don’t have major out out plans through the weekend, and you’ll be all set for luscious locks come Monday morning. Make sure you pick up the Nanokeratin System shampoo and conditioner from the salon to take home with you, too and DON’T even think about hitting it with your Timotei or old gear – it’s got to be SLS and paraben free or it will stop working. I thought I was being super natural using REN at the gym and: no. 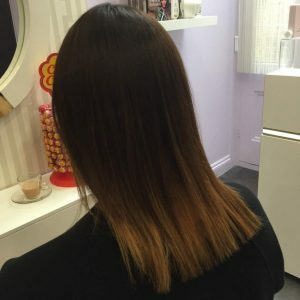 From just £99, depending on your hair’s length (short or long, obvs) and thickness (fine to super thick). Whatever your hair type, this is possibly the most brilliant thing in the world. I never have to have frizzy hair again.